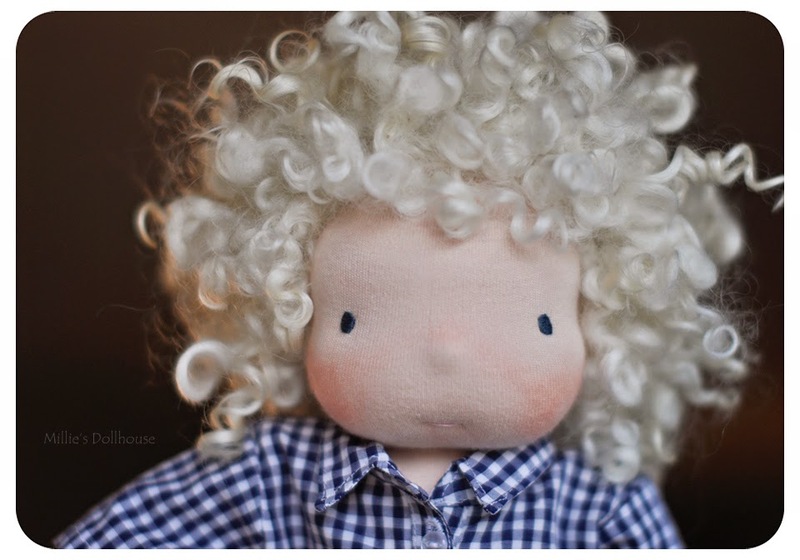 Millie's Dollhouse creates one of a kind handmade dolls from beautiful and natural materials. Each little piece of clothing and every tiny shoe is lovingly handmade in my Indiana studio. This past weekend I traveled back home to Michigan to visit my family and meet my new niece for the first time. It was a chilly, but still beautiful Fall weekend, and we had a blast hanging out, visiting and playing outside in the country. 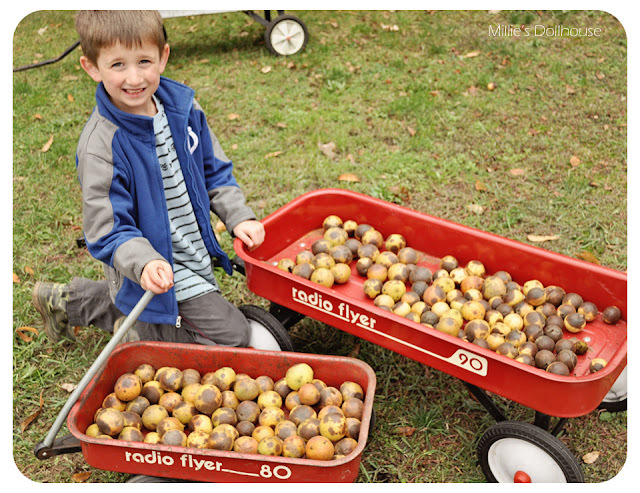 While we were there, the kids collected some of the walnuts from the giant trees in my father's front yard. Walnuts are easily found and are a simple to use natural dye. The bonus is that the kids love running around seeing who can collect the most! 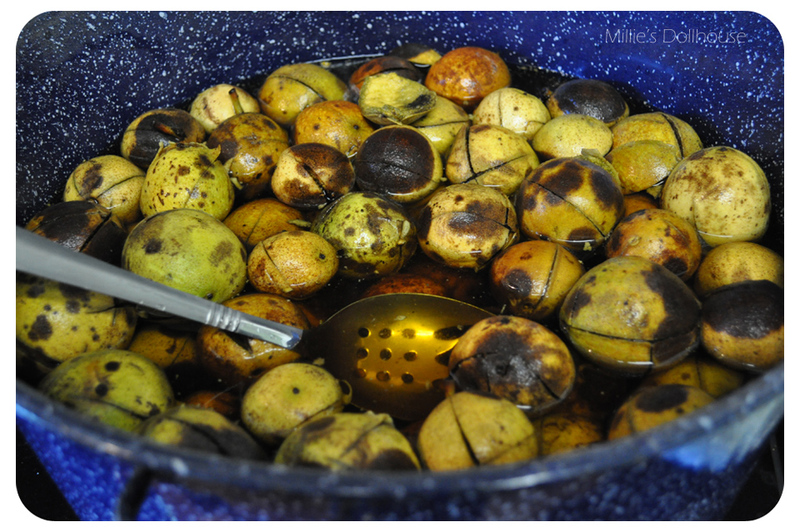 Once home, we gently washed the walnuts, and then sliced through them with a sharp knife to open them up a bit. I found this much easier, and a lot less messy, than removing the husk completely from each nut. 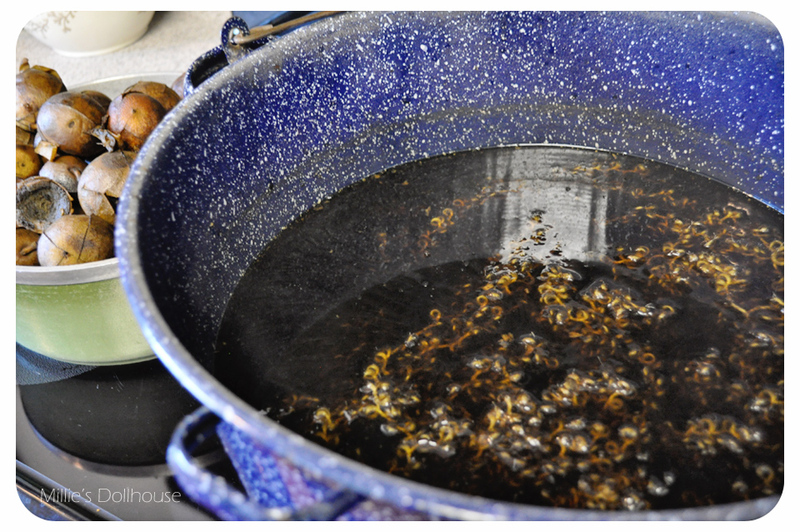 I put these into the water in my big 'ole enamel stock pot and heated it up to boiling, then let it simmer for a few hours as the dye seeped into the water. Once there was enough dye in the dye bath, I removed all the walnuts and used a fine strainer to remove any small pieces. When the dye bath was the same temp as my yarn (which was soaking) I added the yarn to the water and brought the temp back up until the it was just starting to steam. Then I added a bit of vinegar to help the yarn set, and let this simmer on the heat for a few more hours while the yarn slowly soaked up the dye. 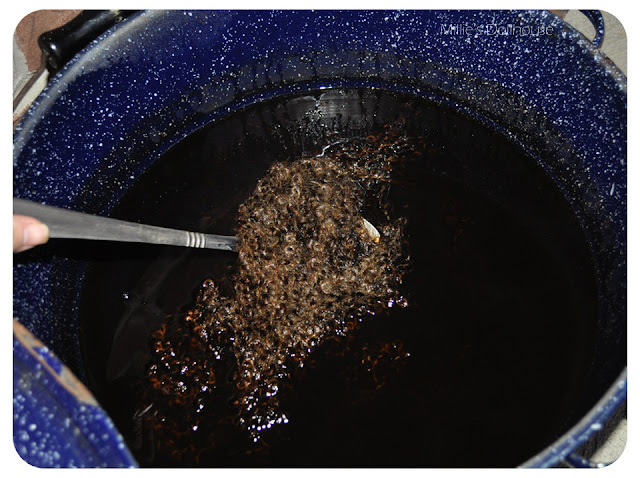 The next step is essential to yarn dyeing. I swear. Really. 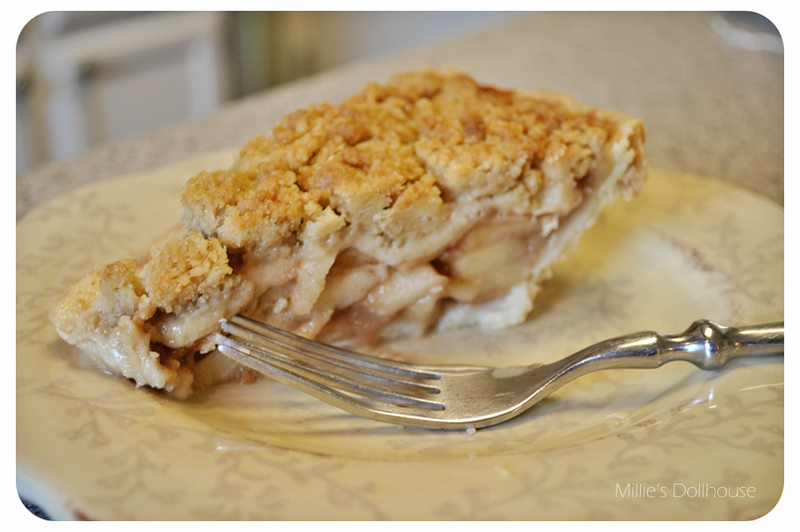 You MUST sit down and enjoy a piece of apple pie while your yarn is simmering. I don't know how it works, but some things it's best not to question! Right? Right! After I finished up my pie and the yarn looked to be about the shade I wanted, I took the pot off the stove (carefully! ), covered it and let it soak overnight. 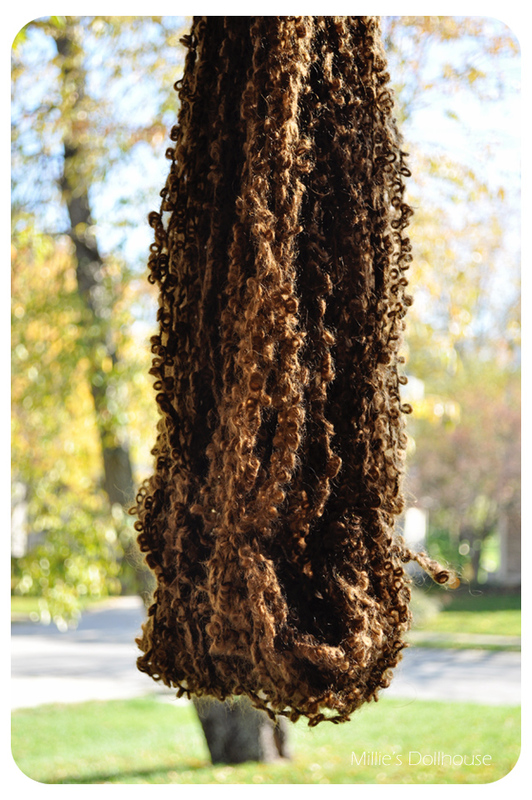 In the morning, the boucle was a nice, richer brown than the night before. After removing my yarn, there was still plenty of dye left in the dye bath to save for later if I wanted to use it again. The next step was to very gently wash and rinse the yarn several times, to remove any excess color in the yarn and to make sure it was nice and clean. I like using the Eucalan delicate wool wash for my yarn, it has a faint eucalyptus scent that I really love. After rinsing and squeezing out the water in a towel, I hung my yarn out to dry. Here it is, almost dry and soon to be wound up! It's a rich, nutty brown yarn that will make such a pretty brunette in the next few weeks! This batch turned out much darker than my last batch and I'm very pleased with the lovely color! 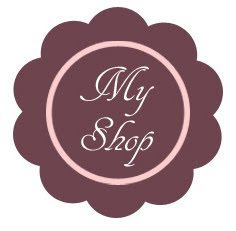 Thank you so much for stopping by Millie's Dollhouse! That is fascinating!! And the "hair" turned out just beautiful!! Gorgeous Katie. I must try this next autumn, we have two walnut trees in the garden. I'd love to see your yarn when you give it a try Jenny. Be careful when collecting the walnuts though, they stain your hands terribly if you aren't wearing gloves! Thanks ladies, it was fun and the kids enjoyed helping out with the process. It really made me appreciate my acid dyes that I usually use! Wow -they really make a beautiful color! Next time I make an apple pie, I'll have to see if I can find some walnuts too so that I can try out your special technique (hee hee)! 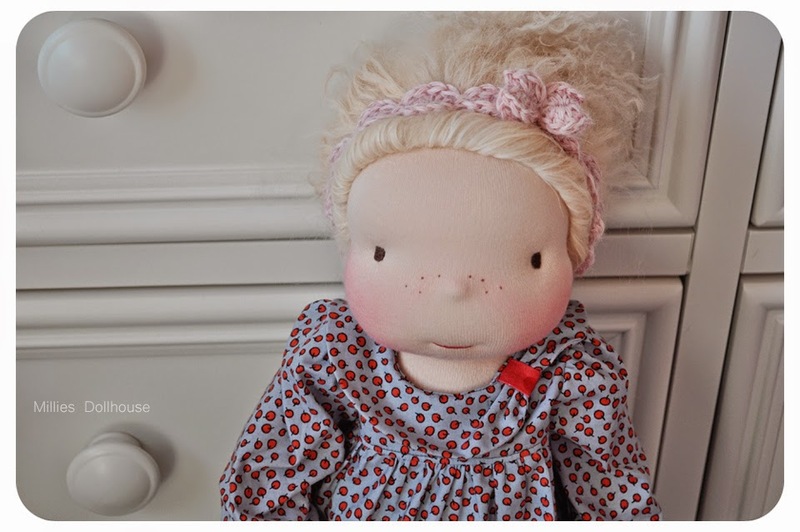 Welcome to Millie's Dollhouse where you'll find my one of a kind dolls, lovingly handmade from natural materials to help foster creative, imaginative play in the young and young at heart. 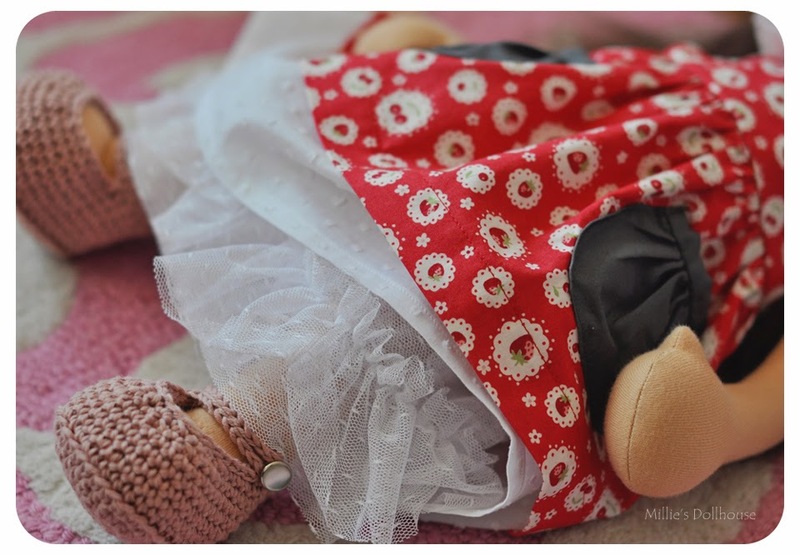 This new little blog will be used to introduce my dolls, their progress, and all the things that inspire me along the way. Thank you for stopping by! -Katie B. Have a question? E-mail me at milliesdollhouse@gmail.com. The wee ones are ready!